‘It’ll be good experience” is the almost cliched stock phrase most supporters utter when a young player of their team goes on loan to a lower league club. The automatic assumption is he’ll come back a better player, slot into the first team and then take over the world. It very rarely happens like that though. Of course, when MOMS reports on Villa’s young breed, we like to stay optimistic. Take Jack Grealish, we’ve already labelled him ‘Villa’s Irish Gem’, because we want him to turnout to be a world beater, but is that simply wishful thinking without much practical thought? Dazzling at youth level is one thing, but it doesn’t mean he’ll cut the cloth at senior level. 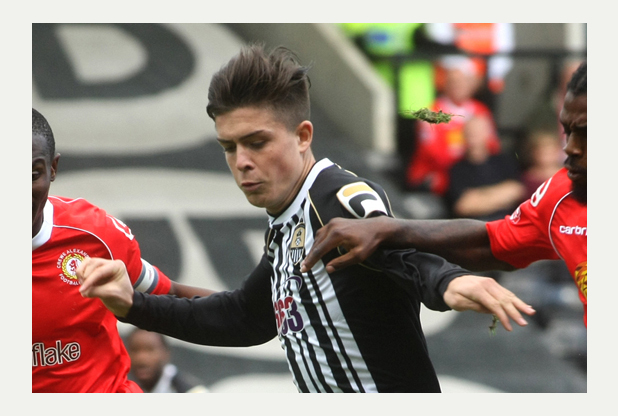 Since Grealish is currently on loan to Notts County, we got long-time Magpie supporter and writer Jacob Daniel to provide us with his thoughts on Grealish’s loan period at Notts County and a more sober viewpoint of the player he’s seen. At a club like Notts County, loanees become a fact of life. They’re a little bit like the postman or the bloke that comes to clamber under the stairs to read the gas meter, they perpetually pass through your life but rarely do you find one that you’d like to invite round for tea. Loanees making their first steps into senior football from Premier League clubs are particularly difficult to get excited about, with every single one arriving at the club with a ‘next big thing’ label tagged around their ears. With fans forming opinions on Youtube highlights clips and academy matches, in which the players who even make it this far invariably stand out. I can’t remember Notts ever bringing in a young loanee from a big club who their fans had written off and were expecting to drift into the obscurity of the lower leagues, which makes it hard to take each new arrival seriously. Jack Grealish has become a case in point of this, with little evidence in his spell at Meadow Lane thus far of the player who is simultaneously the saviour of Aston Villa and Irish football; the slippery, silky attacking talent who dazzled at the NextGen Series. The best thing that can be said of Grealish is that he has passed the first acid test of the young loanee – he actually looks like he wants to be here and is grateful for his first opportunity in senior football, which perhaps makes his peripheral performances in black and white more concerning for the future. His spell started brightly, with his pace and quick feet causing real problems for Tranmere Rovers and Carlisle United, but as his time at Notts winds towards a conclusion it is becoming harder to escape the conclusion that Grealish has been found out by League One defences. Most often used on the left by first Chris Kiwomya and then his replacement, Shaun Derry, Grealish’s reliance on his right foot has led to a frustrating situation where he is constantly being shown aside, coaxed into the trap like a mouse is attracted to a lump of Edam before being suffocated and losing the ball. His final ball is also frustratingly absent, with Grealish’s goals and assists columns since his arrival at the club looking worryingly empty, like the cupboard in the bunker just after the apocalypse. Not that all is lost for Jack – his touch and ability to glide past players that has underpinned the rave reviews he has received as a young footballer have been evidenced, but currently he is being held back by a lack of footballing intelligence and a lack of final product, perhaps the two toughest things to find in the game. To compare him to previous loanees who have floated through Meadow Lane, Grealish is miles away from the explosive talent of the eighteen year-old Thomas Ince, whose brief spell at the club saw him winning games single-handedly and being a central factor to our League One survival come the end of the season. Nor, however, is he a lost cause – a Craig Lindfield who arrived from Liverpool as the new Michael Owen (interestingly he came with far more expectation from their fans than Ince), but left as a player who would drift through a career that has taken in Accrington Stanley, Macclesfield Town and Chester. That Ince is still only a Championship player, albeit perhaps the best, is enough indication that the hype around Grealish must be tempered, however, and that it is perhaps time to stop telling him just how good he is and begin focusing on the areas in which he needs to improve. Talk of him being ready to impact on the Villa first team squad is, frankly, ridiculous for a player currently struggling to impact on a struggling League One side. A loan spell at a side who aren’t quite as dreadful as Notts would be a start, although our season has been deceptive in its incompetence. The side sees far more possession game on game than you might expect for a side marooned at the foot at the table, but is being held back by its lack of creativity, something for which Jack must be somewhat culpable. The overtures around his mythical talent must stop and he should be seen as a promising footballer who has a long way to go, as the evidence of senior football is worth so much more than any internet highlights package. I hope that, one day, I see Jack on Match of the Day and can smile that my club had a small role in his development as a footballer, rather than his name triggering something in my head when he scores a goal for Tamworth or Solihull Moors. Right now, neither would surprise me hugely, but a little bit of realism when it comes to his prospects would perhaps go an awful long way. I disagree with some of the above observations, I have witnessed Jack play a number of times this season in the black and white strips. In my opinion he has shown great majority for someone of the young and tender age of 18, most recently in the very physical game against fellow stragglers Bristol city who were buoyed with the introduction of new manager Steve Cotterill Just two weeks before. It was an obvious expectation of mine that Bristol city would come to meadow lane prepared to play free flowing football having witnessed Cotterills managing style at Notts in the league 2 winning season. Jack constantly wanted the ball and alongside fellow loanee Callum Mcgregor from Scottish champions Celtic ran the game for Notts especially in the second half. Although he has a slight inability with using his left foot, his ball control and touch is unlike anything I have seen from an 18 year old and the way he mangers to turn and skip round players seems to remind me of characteristics usually witnessed from Spanish or Brazilian players. He has a flair and confidence which has not been seen at Notts for a while and I can honestly say it has been a pleasure to watch him play. I believe he has a strong future in the game and I do not believe he is over hyped, I am by no means saying he is the finished article and it would be unfair to expect tat of him at his age, I believe he is showing signs of becoming a top player in the future. Personally I think he has stood out in League 1 and I understand why I have heard rumours this week linking him with a loan deal with a championship side in the new year. I’d just like to say these are my views and obviously opinions on players are merely subjective and that is what makes football such a wonderful game, everything in sport sparks a debate and is what makes people so passionate about the sport. Thanks very much for the comment. Some good points. Lets also not forget that Jack is still only 18. Rather than wrap him up in cotton wool, it’s perhaps a good move by Lambert to put him in a situation that will put hairs on his chest! It’s useful in terms of character building, but a better football team may help in terms of his actual development. Thank you Mr Daniel. That was surprisingly insightful with some useful analysis on Jack. Good article.